A man walks through a hub room where outside information is being gathered and translated by crew members who shuttle it through the circulatory system; he steps into the padded orange room at the center of it all, where he sits down at a black glass table and reports to an inscrutable Control that the enemy is on the move. 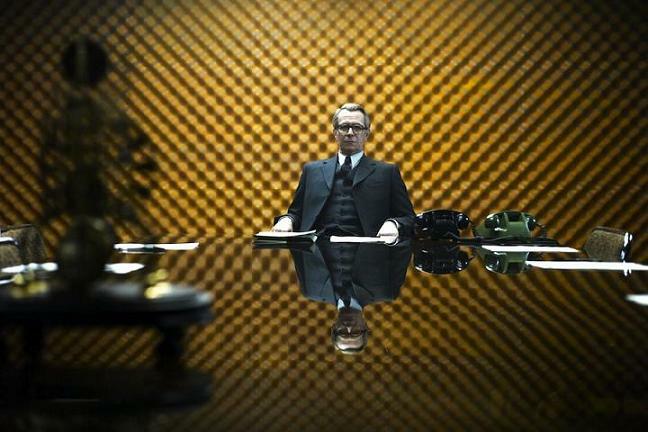 The new adaptation of Tinker Tailor Soldier Spy falls short of its predecessor in some ways (two hours can't cover the scope of six, and Guinness, after all, is gone), but masters it handily in looks; it's shot with care and cunning, and more than one visual nod to stylish sci-fi. The Circus is set up with the same information-processing nodes as the bridge of an underfunded Enterprise, and its windowless orange nexus is shot with as much dread as the control room of the Nostromo (both of them key set pieces where betrayals are exposed). It's a spy movie that takes a secret joy in its own speculative nature. Speculative fiction is a remarkably flexible genre (second only, arguably, to romance), and can enfold all the hallmarks of another genre within its own best-beloved tropes. But there seems to be a particular symbiosis with spy fiction, which has, in large ways and small ones, embraced some of speculative fiction's own favorites. The Gear: The spy who's benefited the most from spy fiction's flirtation with sci-fi is, without a doubt, 007. His career has been studded with crucial gadgets he's used and come up against; some of them feasible (a knife concealed in a shoe), some of them firmly in sci-fi territory (the rocket pack). And his villains have tried their best to keep pace, moving from Fort Knox break-ins to schemes ever more dangerous (satellite dishes hidden in Cuban lakes, *cough*volcano lair*cough*). But the accessories of espionage have also inspired their science fiction counterparts, from code-cracking machines like Enigma to appearance-altering prostheses (generally subtle, in the field; a full-face version of which was awkwardly employed in the first Mission: Impossible and mildly redeemed in its sequel, only to be driven into the ground by the science-fiction B-flick Face/Off ). The Quest: As every film theory class will tell you, the hero's journey is archetypical, and the quest is a general ramble through one of several possible plots. However, fantasy quests have a particular emphasis on the discovery of hidden knowledge and the power of well-chosen words—a natural fit for the world of espionage, which is ready to mention to someone that Rome is slightly cloudy so they can pick up the five-step codex for their hidden almanac, and hidden knowledge is basically the only thing they live for. An easy parallel is the straightforward revenge quest (the provenance of Jason Bourne and Ellen Ripley in equal measure), in which a character will stop at nothing to reveal and destroy the upper echelons of the shadowy rulers who have betrayed them. Exchange the Inception -surreal set pieces of the revamped Tinker Tailor for some slightly more medieval surroundings, and you have a man on a quest to discover his mentor's hidden secret (a word with the power to tear down a kingdom) by gathering a loyal second, an unattainable princess, and an amoral thief to do battle with an advisor to the departed ruler; George Smiley and Luke Skywalker would both be right at home. Of course, the range within each genre is still notable; as spy movies go, Tinker Tailor Soldier Spy is still the agent in the natty suit watching James Bond rocket down the Thames on a speedboat and quietly lifting his own clandestine documents free of the splash. And by that same token, there's no comparison between Tinker Tailor Soldier Spy and, say, Avatar . George Smiley's cinematic science fiction ties are closer to Alien or Moon , where prolonged dread and quiet revelations about the decay within the framework of authority are the order of the day. And whether it's classified information making its way through the pneumatic tubes of the Circus, or the significant change in field agent Jim Prideaux's capture (moving from the deep-woods meetup of the book to an open, busy cafe with the hyper-real quality of a holodeck simulation about to go sour), the visual language of the film highlights the symbiosis and pop-culture exchanges of two genres who are fellow agents (even in a galaxy far, far away).